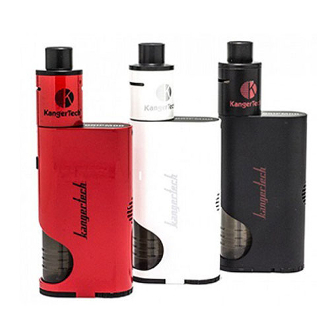 We are proud to present Kanger Dripbox Starter Kit. Its innovative design introduces us to the "squonker", which is a pouch like device that holds your liquid. It allows you to squeeze it and feed liquid into your RDA from below, avoiding the constant dripping method. This new way of re-saturating your cotton keeps your flavor fresh and your vape plentiful. Along with having a new way to drip, this kit features a box mod that goes up to 60 watts and can handle ohms as low as 0.2. Giving you a flavorful and full hit with each inhale! This Mod takes one 18650 battery and includes a pass thru feature allowing you to charge and vape at the same time. So experience dripping the way it should be, the easy way. Due to the high tech nature of this product there is no warranty, returns or exchanges. This product is for experienced users and requires technical vaping knowledge in order to properly use it.